The leading mining companies in Peru have brought a rash of lawsuits to fight an increase in the tax they pay to cover the costs of inspections and oversight of their potentially environmentally damaging activities. (IPS) – The leading mining companies in Peru have brought a rash of lawsuits to fight an increase in the tax they pay to cover the costs of inspections and oversight of their potentially environmentally damaging activities. The lawsuits have come one after another. As of Aug. 7, 14 mining companies had filed legal injunctions in different courts to fight the “Aporte por Regulación” (APR – Regulation Contribution) that they are charged, Environment Minister Manuel Pulgar-Vidal told IPS. The legal action targets different institutions in the executive branch, including the Presidency of the Council of Ministers, the Ministry of Economy and Finance, the Ministry of Environment, the Ministry of Energy and Mines, and OEFA, Peru’s environmental oversight agency, which collects the APR. 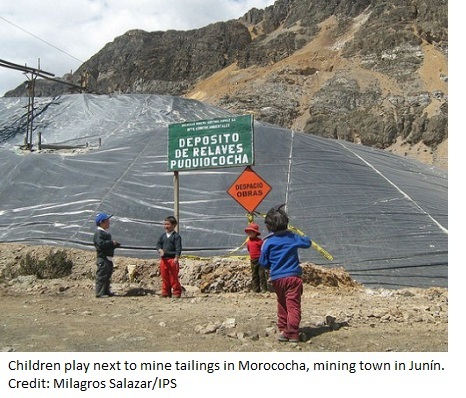 Javier Velarde, the general manager of the Yanacocha mining company, told IPS that a total of 26 mining corporations, including his firm – the largest gold producer in Latin America – have brought legal action against the APR. Yanacocha is a joint venture owned by the U.S.-based Newmont Mining Corporation and the Peruvian company Buenaventura. The National Society of Mining, Oil and Energy, which represents the leading companies in the industry, also brought action against the APR, arguing that it is unconstitutional. At the same time, four companies opened administrative proceedings with the Commission for the Elimination of Bureaucratic Barriers of the National Institute for Defence of Competition and Protection of Intellectual Property (INDECOPI). The companies argue that the APR amounts to a “confiscation”. 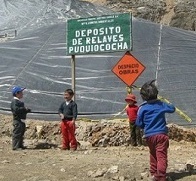 One of the companies that turned to INDECOPI is the Peruvian firm Caudalosa, which in 2010 caused a major spill of toxic waste from a tailings dam, poisoning the rivers that provide water to the people of Huancavelica in central Peru, one of the poorest departments (regions) in the country. The corporations that have brought court action include foreign firms like Cerro Verde, a subsidiary of the U.S.-based Freeport-McMoRan Copper & Gold Inc, and two subsidiaries of the Anglo-Swiss multinational Glencore Xstrata. The Peruvian companies include Casapalca, which is facing several lawsuits for environmental, labour and safety violations, and Volcan, which has been fined on a number of occasions for causing environmental damage. “Companies are getting bolder and bolder,” in a political context where efforts are being made to reduce “bureaucratic hurdles” to investment, Deputy Minister of Environmental Management José de Echave told IPS. In July, Congress approved a package of measures introduced by the government of President Ollanta Humala to boost private sector investment by simplifying environmental requirements and streamlining bureaucratic procedures, due to the slowdown in the economy triggered by declining demand for raw materials. Peru is the world’s fifth-largest producer of gold, second of silver, third of copper, zinc and tin, and fourth of lead. Mining accounts for nine percent of the country’s GDP, 60 percent of exports, 21 percent of private investment and 30 percent of income tax. It also provides mining companies with billions of dollars in profits. “We are defending ourselves and we are sure that we will demonstrate that the measure has sound legal standing,” Minister Pulgar-Vidal told IPS, after confirming that the judiciary had already thrown out one of the lawsuits, filed by Antapaccay, a subsidiary of Glencore Xstrata. The inspection tax was originally created in 2000 to finance the regulatory agencies. It was established at the time that the contribution would not exceed one percent of a company’s annual earnings after taxes, OEFA officials explained. But in December, the government decreed that the contribution would be reduced to 0.15 percent of annual sales in 2014 and 2015, and to 0.13 percent in 2016. The president of the OEFA board of directors, Hugo Gómez, said that if one percent was not a “confiscation” then a smaller contribution was even less so. At stake in this legal battle is not only money but also the Independence of environmental oversight activities. Before OEFA took over the environmental monitoring of the mining industry in 2010, the task was in the hands of the Supervisory Body for Investment in Energy and Mining, which charged a “mining tariff”. The tariff was calculated according to what the Supervisory Body specifically spent for each company inspected: days of work for the inspector, costs of lab testing of samples, and other expenses for services. The companies were billed directly for the cost of the inspections, OEFA director of supervision, Delia Morales, told IPS. The tariff system was inherited by OEFA, but in December 2013, a percentage for the APR was set, which brought in more money. From nearly 400,000 dollars, which the regulatory body took in with the mining tariff in 2013, the total went up to nine million dollars under the APR in the first half of this year alone. OEFA estimates that it will bring in some 15 million dollars this year for oversight of the mining industry alone. Up to mid-2013, it had collected 17 million dollars for monitoring and inspection of three sectors: fossil fuels, mining and electricity. IPS learned that in its court injunction against the APR, Xstrata Las Bambas, which also belongs to Glencore Xstrata, argued that with the new APR it ended up paying 36 times more than what it paid with the mining tariff. “It was an outdated system” that did not make it possible to carry out technical work and prevention efforts to inform communities of what impacts the extractive industry activities could have, Morales said. The manager of Yanacocha said he did agree that mining companies should finance oversight activities. But he argued that they should be charged in relation to “the real costs” and should not have to finance other activities that are not directly related to monitoring and inspection. In his view, “It’s fair for the companies that receive significant benefits” to pay for the oversight, because they carry out activities that pose serious environmental risks. Lanegra said it would not be right for the expense to be financed with the taxes paid by all Peruvians.